Berlin is far away from the steep and stony soils that produce the world’s best Rieslings, but is very much at the heart of its consumption. 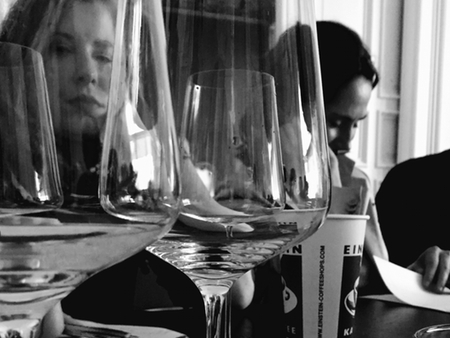 On June 19, a thirsty, thoughtful band gathered at the home of wine connoisseur Martin Zwick for the third edition of his annual BerlinKabinettCup. The wine salon was convened to evaluate and assess the 2014 vintage. With classic style and grace, Martin assembled a jury of 12 sommeliers, journalists, retailers, and wine lovers, as well as 39 Kabinett Rieslings hailing from the Mosel (including the Saar and Ruwer), Nahe, Rheinhessen, and Rheingau winegrowing regions. The wines had all been properly chilled and prepared under identical conditions, and none were decanted. Three flights of 10 wines were served, with scores recorded manually by a single scribe at the end of each flight. The order of the wines and flights were assembled by Lars Carlberg. It took me the whole summer (sorry for the delay, Martin!) to finally put to words my own thoughts on what it means to be a Kabinett. And even then my thoughts could only take shape by leaning on the broad shoulders and sharp pen of the Czech author Milan Kundera, who famously wrote of The Unbearable Lightness of Being. Kundera's literary masterpiece—go read it if you haven't!—explores themes far more encompassing and wide-reaching than wine, but in the end the central paradox that drives the book—the ephemeral nature of lightness—is the same paradox found in these Kabinett wines, and what both divided the jury and shaped the Cup's results as well. To wit: a style of wine known for its grace and tension was nonetheless being measured against the inevitable human preference for the intensity of taste, especially when that taste is good. The power of Kabinett for me is drawn from its approachability, from lightness rather than strength, from the electrifying tension of equal parts sweet and acidic. It is charming yet also complex. It ages well, is exceptionally food friendly, and at its core is simply lovely to be around. It is a style unlike any other in the world, it was agreed, with power stemming from balance, grace, and authenticity. But how is that balance defined: within the wine itself, or within the group of wines as a whole? 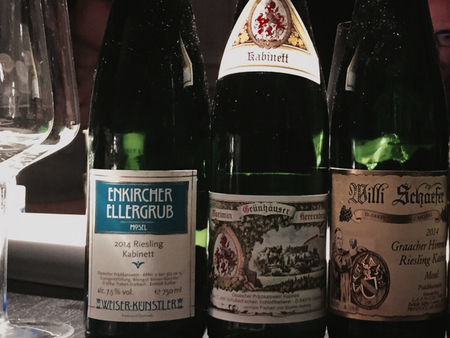 The panel declared a three-way tie among three wines from the same wine region (Mosel), yet each wine featured a fundamentally different style. The dichotomy of personal preferences was fascinating. Take, for example, two of those top three scoring wines, from Weiser-Künstler and Willi Schaefer. A quick look at my own notes (see below) offers a sensory representation of Kundera's paradox. They could have been the two main characters of the novel—one of weighty permanence, the other of fleeting grace. Both excellent, both necessary, both stunning but for very different reasons and tastes. Weiser-Künstler, 2014 Enkircher Ellergrub Riesling Kabinett (Mosel, 90 points): Powerful ripe notes of apricot, taut and muscular. Heavy wet stone and a touch of undercooked biscuit. Willi Schaefer, 2014 Graacher Himmelreich Riesling Kabinett (Mosel, 90 points): Sleek, playful, fleeting and nuanced as it moves in the glass. Crisp acidity, grapefruit and hints of ripe passionfruit. Lovely and lingering citrus finish. Each of my notes uniformly cited the playful, ephemeral nature of the wine, valuing in a sense that which is not said as much if not more than what is said: "Summer sunset in the mountains of Vermont; delicate, lacy and shy. The colors of a setting sun captured in a glass; wildflowers, crisp and nipping but never biting. Playful, thyme notes. Yes, please." Rather than the classic varietal expression of ripe peach and apricot, the wines for me needed to evoke a dynamic image, color, emotion, something as ephemeral in life as it is in taste, something that would be gone almost before the descriptions were dry on the paper. The tension comes perhaps from knowing that it IS fleeting, a quickly passing moment in time. This is not to say that the wines have a short cellar life—to the contrary, these are wines at the very beginning of their existence—but rather their nature, their character values fleeting over permanence. It is the Lightness of Being. Here is a link to the full listing of scores for the evening. It struck me that a number of the lower-scoring wines were also the traditional, established estates, which routinely shine only after five-plus years in the bottle. Is it fair to evaluate a wine whose time has not yet come? To really assess fairly, I would love to see 2014/2020 BerlinKabinettCup Reloaded. A meeting in five years’ time with the same bottles, same methods, same jury. Who's in? Photographs courtesy of Paula Sidore. Paula Redes Sidore is an American-born, German-trained wine writer, translator, and sommelière living and writing in Berlin. She is also the co-founder and driving force behind Weinstory. That’s a beautiful quote, Lars. And thanks for the chance to voice my thoughts on what really makes a Kabinett so special. I am in for the 2014/2020. Beautiful article. Thanks for writing. Thanks, Robert. It’s almost easy to write beautifully about a beautiful thing. Indeed, very nice article. Funny that to exemplify the different styles you chose the Weiser-Kuenstler and the Willi Schaefer, which I could recently taste in their respective cellars with just a night in between, but the difference was stunning. I thought the W-K Kabinett was more like a Spaetlese (and the Spaetlese an Auslese), but perhaps it’s just a matter of style. The Himmelreich was ethereal and a wonderful weightless Kabinett. I am thrilled to read that Joh. Bapt. Schaefer showed so well. This is a less well known producers, which I got to know thanks to a local retailer, but so far I have tried only his dry wines. From these I would not have guessed that his Kabinetts could be subtle, “playful and ephemeral”. I need to try one. Thanks for your comment, Gilberto. Tonight, I re-tasted Willi Schaefer’s 2014 Graacher Himmelreich Kabinett at Yong Yong in Trier. It tastes less noticeably sweet than a few months ago. Back in June, I found Weiser-Künstler’s 2014 Enkircher Ellergrub had more verve. This shows how the wines change over time. I should add, too, that Schaefer’s Himmelreich has more of a Saar-like character. As Paula pointed out, it’s the crispness and citrus flavors. I often found it to be the case that Schaefer’s Himmelreich Kabinett had a leaner, more minerally character (you could say more Saar-like), compared to the Domprobst Kabinett. I enjoyed the article but it confirmed, too, that the 100-point scale is meaningless. The author aptly summed in up in her question: “Is it fair to evaluate a wine whose time has not yet come?” Perhaps, but not with numbers. Mark, I agree. It has a “leaner, more minerally character.” I also don’t care for point scores. I share your opinon, Mark, on the nature of the Himmelreich — and admit to having a soft spot for Saar wines… thus it’s no surpise that it came out ahead in my mind. I believe that Saar wines embody the character of the Kabinett better than most. But that’s another article entirely. Thanks for the write up! Fortunately I have all three wines that were scored the highest in my cellar, so I can bear (or not) with the (un)bearable lightness of those kabinetts in the future. PS. I had Weiser-Künstler Enkircher Ellergrub Riesling Spätlese 2014 just yesterday and it didn’t feel like auslese to me at all in terms of both sweetness and concentration, not mentioning botrytis. Marcin, you have a well-stocked cellar of 2014 Kabinetts. One of the top wines missing from the tasting was Vollenweider’s 2014 Wolfer Goldgrube Kabinett. I had a chance to pour this wine in the spring at Zurlauben. Today, the Klitzekleine Ring has its Tafelrunde. I’ll get a chance to taste Weiser-Künstler’s 2014s once again. I really liked the 2013 Enkircher Ellergrub Spätlese. Thank you for the great article, Paula! You’re welcome, Andrew. Appreciate the compliment! Literature and wine, what’s not to like? Thanks for the thoughtful and thought-provoking account, Paula! I preface some observations with a two-fold apology: First, that I’ve neglected to take time to offer specific examples of my points; and second, lest my stating the reason for that neglect, namely a time-crunch to begin publishing my Austrian and German vintage reports and tasting notes with Vinous, be interpreted as self-advertisement. It’s true that Kabinetts of the sort under discussion can sometimes need some years in the bottle to show best. But my experience is that if one of them shows awkwardly in its first year and genuinely NEEDS time in bottle to show well, that’s usually for one of two reasons. The first is post-fermentative stink of the sort into whose origins few observers of the German wine scene have delved more diligently than has Lars, but without having succeeded in really understanding its origins. Both he and I have solicited and collected comments from many growers and scientists without the seeming capriciousness of this phenomenon having been explained to our satisfaction. It is clear though that spontaneously- and cold-fermented wines with high levels of fructose are especially susceptible, a prime case in point being Riesling Kabinetts. The other prime source of disappointment I find in youthful Kabinetts, but one that will respond well to extended cellaring, is perceived sweetness too prominent to permit full appreciation of the wines’ incipient nuances, much less full demonstration of their potential usefulness at table. I’m nowadays enjoying a lot of Mosel Kabinetts that I collected from the 1980s and early 1990s, quite a few of which I preferred not to drink in their youth because of dominant sweetness. And at least 75% of the youthful Riesling Kabinetts I taste today harbor 25-50% more residual sugar than did Kabinetts from those same estates in the 1980s and early ’90s. Over the past 3-5 years, an increasing number of growers are at least talking about in principle lowering the levels of residual sugar in their Kabinetts, though some of those who are actually doing something along those lines are proceeding very cautiously, on the principle that disturbing customer expectations would be unwise. There’s no question that some quite magical young Kabinetts can largely hide levels of sugar as high as 50-70 grams, but a whole lot more in that analytical league strike me as hiding their potential virtues under too heavy a blanket of sweetness. There is some truth to the observation that in many recent years growers have had to choose between sinning on the side of residual sugar or that of alcohol. (Note that one hears this with regard to residually sweet Kabinetts, not with regard to Grosse Gewächse, constrained as those are by a ten gram upper bound not to mention by ideological fetters ;- ) Nevertheless, there are still quite a few wonderful legally trocken and halbtrocken Rieslings that exhibit levity and weigh-in at less than 11% alcohol, and given that this is so, how much wider are the opportunities at, say, 20-35 grams of residual sugar? This is especially true of vintage 2014. I just returned from visiting and tasting their 2014s with a hundred German Riesling growers and I have NEVER before tasted from one vintage so many delightful dry or dry-tasting wines of 11% or less alcohol. I don’t mean never before so many German Rieslings but never so many such lightweight essentially dry wines AT ALL. You have to go back to the 1980s to find so many such German Rieslings, and then often from vintages like 1980 or 1984 that are with good reason un-lamented. Even if one focuses on vintages of unjustly neglected virtue such as 1981 and 1986, many fewer growers then demonstrated the viticultural and cellar standards that we virtually take for granted today. And bear in mind that I’m making this claim even though significant sectors of the greater Mosel area were just too compromised by rot to render really outstanding Rieslings regardless of alcohol level. Even so, I find the number of low alcohol successes Germany-wide unprecedented. I’m going on here about trocken and halbtrocken Rieslings, but my point in present context is that if so many of these are delightfully buoyant and animated in 2014 and harbor under-11% alcohol, how many more with taste-able sweetness were possible without coming remotely near 50 grams of residual sugar? Especially at my age and with a cellar still harboring plenty of aged Riesling, I’m looking for levity allied to youthful expressiveness; versatility at table; and the potential for solo sipping satisfaction even outdoors in a Midwestern US summer. A significant share if not the majority of the excellent young residually sweet Kabinetts I taste nowadays fall short of those added personal criteria due to their sheer sweetness. Thanks for your reply to Paula’s article, David. The VDP has lost sight of the light, dry to off-dry wines with levity. Thanks for your additional thoughts – I always appreciate any historical info on Mosel Riesling. Best of luck with Vinous, and I hope you’ll continue to post here! Thank you very much for the insightful article and replies. Kabinett remains a category of great importance to me both with food and without, and finding one with the expected (hoped for?) grace, elegance and in fact playfulness is one of my great joys with German Riesling. As David Schildknecht mentions in his comment, the drier style wines have become more common, and it is those wines (e.g. Selbach’s Himmelreich Halbtrocken) that give me much immediate pleasure, while also being age worthy. The “regular” kabinetts, often are laid down for long sleep after tasting one or maybe 2 sample bottles. My cellar does not go back as far as David’s, but kabinetts from the mid to late ’90s are now showing the way I prefer them as dinner wines. Given the quality level of modern kabinett, I have no doubt that recent vintages of some of the top wines tasted in the competition (and many others) will repay similar patience. As for scores, well sometimes we do what we have to do. For now, fall has finally arrived in the northeast US, and a glass of kabinett at sunset on a crisp fall evening is about as perfect as I can stand. A good friend in Trier also likes to cellar the so-called classic Kabinetts from top producers, such as J.J. Prüm, Maximin Grünhaus, and Weiser-Künstler. Thanks, David ! I don’t have nearly the breadth and reach of your experience with aged Rieslings to be able to speak knowlegably to the change in styles. However, the experiences I do have reflect yours as well. So often young Kabis suffer under a robe of simple sugar. It’s not that they’re bad but — in the best of them — I get a 2 second peek behind the curtain at their potential before its closed off for a number of years. Tasting in their youth does little more than give a suggestion of their structure, their nature — but the nuance, the finesse, the playfulness in my experience takes years to reveal itself. That said, 2014 was a bit of an exception. It makes me wonder how exactly they age. I guess I’ll have to stock the cellar and sit back and wait. I can’t speak to the similarity of a mid-western and Berlin summer but I’m guessing they’re not that far apart. Salut! I think you misunderstood the significance of my apologetic introduction to the above posting. I am in the business (once again ;- ) of critiquing young German Rieslings, so OF COURSE I am willing to and shall “name names.” It’s just that the context for doing so and the time available to do so well with regard to the last two German vintages will be in the context of my reports for Vinous. Thanks for your further observations. There are however three important caveats to the case for cellaring 2014 vintage Riesling Kabinetts (didn’t you just know something like this was coming? ), two of which are the same caveats that apply to any purchases of 2014 vintage German Rieslings whether or not with the intention of long-term cellaring. If there is low-level taint with rot or acetification and volatility – both of which abounded in 2014 – but you fail to pick-up on this when tasting the wine very early on, then you may be in for an unfortunate later (and not necessarily that much later) surprise. Even among the wines so obviously chosen with great scrutiny for this year’s Cup competition, I spot a few that I thought when tasting them last month were slightly compromised in one or both of the aforementioned ways. And I would not be surprised if sheer surfeit of sweetness were one reason why negative traits were masked early-on. With regard to these last two observations I want to tread with special caution, so I won’t try to speak with further specificity until I have carefully reviewed my notes and done some repeat-tastings. As an aside, having brought-up the notion of “masking” it occurs to me that I should never let slip such an opportunity to castigate the countless growers and critics (especially in Riesling-Germany but also in Champagne) who argue, completely fallaciously, as follows: Residual sugar can mask a wine’s flaws. This means that a wine without residual sugar is more open to inspection and hence indicative that a grower believes he or she has nothing to hide. Therefore, (wrong!) honest growers are those who minimize residual sugar in their wines and (wrong again!) residual sugar in wines is a sign, or should at least arouse the suspicion, that their grower has something to hide. The third caveat (did you lose count? ;- ) when drawing analogies between Kabinetts of the ’80s or early ’90s and those rendered today regards a difference that will be reflected in analyses – but most wine lovers do not get to read those and even if one did, the difference I have in mind will not be subject to clear interpretation even by experts. I’m referring to how much sulfur is added to the wine. Nowadays, there are many growers of Riesling Kabinett utilizing far lower levels both in elevage and at bottling than were standard two or more decades ago. My experience suggests that this is all to the good in terms of generating a wine more expressive and texturally alluring in its youth. But it is at least a reasonable supposition that lower sulfur will come at a slight price in terms of total longevity. As it happens (probably another phenomenon connected with freakishly high extract levels) 2014 German Riesling “ate” sulfur at an alarming rate, to such an extent that not a few growers were left with wines they could not (for the time being anyway) get approved for sale because total sulfur levels were excessive. Even so, there are many growers in 2014 too who choose to accept lower levels of sulfur dosage even if that also results in lower levels of free (i.e. available anti-oxidant) sulfur. One more aside on account of another opportunity it would always be a shame to waste, but especially in a discussion of Kabinett Rieslings which often exhibit a lot of “spritz.” If – as most growers, not just those of German Riesling, and even some oenological advisors would have us believe – there is a connection between residual CO2 dissolved in a wine and its longevity, then this can only be on account of some scientific principle as yet unknown and untested. I’ve been round and round on this subject with many chemists and written about it in more detail in my columns in The World of Fine Wine and Vinaria. Apologies therefore that on this occasion I’m being dogmatic rather than delving into much detail. CO2 is NOT, chemically speaking, an anti-oxidant. It can however play two roles in protecting wines from oxidation, and since most growers are familiar with at least one of if not both of those roles, that probably contributes to the erroneous belief so many of them hold concerning residual CO2 in bottle. Both of the aforementioned roles can be explained physically, i.e. without bringing-in chemical reactions with CO2. The first role is as a blanket or barrier, a role most familiar from young wines in barrel after undergoing malo-lactic transformation. Here, a layer of CO2 that is being renewed from dissolved residues in the wine physically intervenes to prevent the wine from contacting air, and thus from reacting with oxygen. The second involves a technique known as sparging (or other procedures that have similar effect), whereby a stream of CO2 can be used to actively displace oxygen dissolved in a wine. In sophisticated commercial-scale cellars, this is frequently done at bottling. Once the activity of CO2 injection ceases, oxygen will again start building-up. Neither of these roles played by CO2 has any relevance to possible effects when dissolved in bottled wine. Incidentally, as Lars will tell you (link, please, Lars — you can locate one faster than I!) German entrepreneurs in the late 19th and early 20th century advertised their “wine rejuvenating” apparatuses for injecting CO2 into “old” Mosel Riesling (in cask) that no longer displayed one of the features responsible for the rise in this genre’s popularity, namely spritz. And this suggests two other causes for misunderstanding. We associate dissolved CO2 with vinous youthfulness, and we associate it with LIVEliness on the palate. But a moment’s reflection should really suffice to correct any misunderstanding. It is not only easy to imagine an utterly madeirized wine saturated with CO2; you can easily generate one if you have a seltzer bottle! Aren’t you sorry you (didn’t) ask about all of this?! Obviously, I should have known better that you’d be reporting on German wines for Vinous. I’m still editing an article on Mosel wine. Once it has been published, I’ll a provide a link to that 19th-century ad of a Trier firm that claims to rejuvenate tired Mosel Riesling by injecting carbon dioxide. Well with any luck I’ll be tasting a number of 1990 Rieslings with Stuart Pigott next week and be able to put some of these (valuable, thank you!) observations and assertions to the test. And should Martin find fit to time the tasting right, with any luck we can discuss this in person next year (or ProWein, perhaps?). You bring up an interesting concept that has been a theme in discussion over the last few weeks in talks with winemakers and, most recently, in Champagnes (another speciality of mine). I admit that for a while I fell into the “sugar as make-up”camp. Yet having seen the role sugar plays in aged Rieslings, I’ve come around completely. Held in check, It is the key cornerstone of a beautiful balanced whole. Without it, the wine might be more raw, yes, but what about balance? Tough for tough’s sake does not a great wine make. Or to put it in culinary terms: The best dish in the world if made without salt or spice or another key ingrediant is going to be the lesser dish for it. It’s there for a reason. So too for sugar. In the right hands a careful hand with sugar enhances the very elements that make a kabi amazing, both now and in the future. And when the role of the sugar is to hide or otherwise make up for other weaknesses it is often, to my tongue, pretty noticeable or, at the very least heavy handed enough to draw my scrutiny. Just what IS the role of sugar in aging of Riesling or any other wine? That is the larger question I meant to signal my uncertainty about. That esterification or other chemical alterations of sugars as wines age contribute to what we taste must surely be correct. But does the presence of residual sugar conduce to more exciting mature wines? And is there a correlation between the presence of residual sugar (other than at BA-TBA levels where sheer osmotic pressure has preservative repercussions) and the rapidity with which a wine succumbs to old age and oxidation? I’m not convinced that the answer to either of those questions is “yes,” not given how many sensational 50-100 year old German Rieslings I’ve tasted that were known to have begun life at fewer than a dozen grams of residual sugar. About residual sugar’s contributing in MANY wines, and most notably in German Rieslings, to balance and complexity, I not surprisingly wholeheartedly concur with you. But I would not want “many” to be taken as suggesting MOST, or at least not unless one’s talking about contributions of residual sugar at very low levels. Otherwise, we’d be left unable to explain the existence of so many outstanding and well-balanced legally trocken German Rieslings. I will arrange it for the second week of june. Just for the record, the wines at my “BerlinKabinettCup” this year would have clearly benefited from a bit of oxygen. I should have opened the bottles the night before which I always do with the GGs at my Cups. I tasted several Kabinetts the next day and all of them performed much better. Also the stink had gone away. I took the advice of a Mosel winemaker to open the bottles fresh from the fridge. I was quite sad about this misstep, but this could happen. Anyway, the estate Weiser-Künstler is a worthy winner. Wow — I must extend a heartfelt THANK YOU to Lars for giving us this platform to share ideas! This here is what I love about wine, and wine people but it is also the sort of thoughtful, considered and knowledgeable exchange that rarely takes place in the written form (My preferred medium as it allows me to consider the content of my ideas not the piece of spinach stuck between my teeth or whether I have incorrectly conjugated the dative case. Again.). Being a relative nascent Riesling convert in Germany (talk about an immersion course!) has allowed me an interesting vantage point. Because I was a red wine drinker before coming to Germany, I came to Riesling — and German wine for that matter– with no preconcieved notions of sweet, dry or otherwise. Thus for me it’s not about sweet vs dry, but rather balance. Weight, the element that screws up balance, can come from sugar OR it can come from alcohol. Hence you can have a heavy, prizeweighter of a wine that is nonetheless bone dry just as you can also have a sticky syrupy mess of an auslese. Both are problematic. Weightless, playful shapeshifting yet intense and cellarable Rieslings are something truly unique to the conditions and long expertise Germany has to offer. The role of sugar as I see it — and I think this has traditionally been the case to which you, David and Lars, both alluded — is one element whose job it is to acheive and or enhance balance and stabliity (again, like salt in a recipe). It’s not about whether something tastes sweet or dry but whether the whole is greater than the sum of its parts. You’re welcome, Paula. I appreciate the shout-out. Amen, Paula re preferred medium as well as vinous balance (and yeah, that dative bugs me, too ;- ). Great discussion, thank you all! Nice to meet again David in cyberspace after the fortuitous, short but pleasurable encounter in a Mosel cellar. Tonight, I came across this site with a ranking of the wines. Two Scharzhofberger came in last place.